Bemco History and Background and Conrad / Missimer History. Bemco was founded in 1951 and remains a privately held California corporation. Located in Simi Valley, we are about 45 miles Northwest of the Los Angeles International Airport and 30 miles West of the Burbank Airport in fast growing Ventura County, California. By clicking on the image of our facility, you can download a map showing the location of our factory. Our modern facility includes sheet metal, structural steel, and machining equipment, vacuum, electrical and refrigeration piping apparatus, monitoring instrumentation, a rapid response stock room, and the utilities needed to test large systems. Our greatest asset is our people. Many of our engineers have over 30 years of experience and the average experience in our production facility is over 15 years. By drawing on the breadth of knowledge and experience of our engineering and highly trained manufacturing staff and by using only proven materials we continue our tradition of making truly excellent equipment. Selected by Lockheed Missiles and Space to make to the very first Orbital Space Simulator in 1958, Bemco was able to take advantage of its California location to become involved in many of the exciting programs in the 1950's and 60s. As the aerospace, electronics, and automobile industries grew, Bemco began expanding its product line to meet the needs of its ever expanding customer base. In 1972, Bemco purchased Conrad/Missimer (a company manufacturing environmental test equipment founded in the 1930's) from Gulf and Western (now Viacom Industries - Paramount Pictures, CBS, MTV, Dreamworks and etc. ), the then largest manufacturer of Environmental Test Equipment in the United States. Requests for Bemco chambers now come from all sectors of American and International business including aerospace, defense, electronics, automobile, and consumer products. Large or small, standard or custom, we are ready to meet the challenge. Bemco's founder, Mr. Warren Bruskrud, sitting in the cockpit of his P38 during WWII. Bemco has always been a leader in the Environmental Test Equipment field. In the 1960's, Bemco together with other major companies making environmental test equipment including Missimer's Inc. - now part of the Conrad/Missimer Division of Bemco Inc. - were cofounders of the IES, now the IEST, the Institute for Environmental Sciences and Technology. The IEST, together with NASA, AIAA, ASTM, CSA, and JHUAPL, annually sponsor the United States Space Simulation Conference, now in its 24th year. Ample proof of Bemco's long-standing dedication to quality can be found in test labs all over the world. Of the many thousands of systems Bemco has made over the years, most units manufactured over thirty years ago and some units manufactured forty to fifty years ago are still in use today. Shown above is an early 1960's Bemcoil thermal shroud, a 1970's combined AFWV Series Temperature/Humidity/Altitude/Vibration chamber ready for loading onto a vibration table, a 1960's combined space chamber and xenon lamp solar simulator, and a large scale Bemco early 1970's AGREE style temperature/vibration testing facility for testing the F111 fighter/bomber radar. A reprint of an article from the April, 1971 issue of the magazine "Research and Development" describing this facility is available by clicking here. The larger photograph at the top of this page is the control room of the previously mentioned first Orbital Space Simulator. Shown in this group of pictures are the 1970's era Bemcoil liquid nitrogen circuited shroud (18 feet in diameter) that housed the Apollo Astronauts and the Apollo Capsule running at -185 C, one of the large Bemco temperature/humidity chambers used in the 1970's to characterize the mechanical properties of carbon composite laminate structures, an early 1960's ultra high vacuum system with bake out, and an early 1960's era Bemco Temperature/Vibration Chamber with hydraulic lift. The first picture is an early 60's Space Simulator claimed by Aerojet in their "Booster" publication to be "One of the finest space simulation laboratories in the country . . ." The group also shows a 70's era Temperature/Humidity/Altitude chamber in use at NASA, a early 60's era, 64 cubic foot Sand and Dust Chamber in final test, and a 70's era dual flooded compound -40 C Coolanol Fluid Chiller, one of the precursors to Bemco's extensive fluid chiller line today. Shown here is an early Bemco 1960's era Centrifuge Environmental Test Chamber in a pit, a 1970's Bemco Gaseous Nitrogen Glove Box Conditioning System designed for use with an airlock type glove box, the 1950's era bulletin that announced the first P200, a chamber that is still copied by many companies today (click on the image to see a larger picture), and a 1970's era Bemco Walk-in Temperature/Humidity/Altitude Chamber. 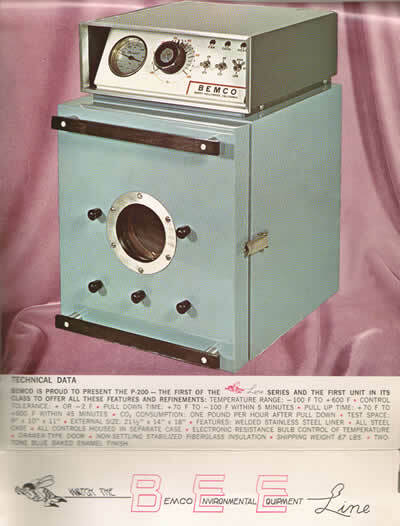 The first picture in this group shows an early 1960's era Bemco AGREE Chamber, one of eleven of the very first three zone, hot-cold-hot FS3V Series Vertical Thermal Shock Chambers pioneered by, and invented by, Bemco in the 70's, a modern Bemco AH Series Space Simulator, and a modern Bemco PCL Series Fluid Chiller. The pictures in this group include a bulletin describing a Conrad Corporation temperature/vibration chamber - almost identical to the Bemco chamber shown in the previous group, printed while they were still in Holland, Michigan but owned by Gulf and Western dating from about 1964. You can download a .pdf copy of the actual bulletin by clicking on the image. It is a 391 kB file. Similarly, the Missimers short form catalog dated April, 1965, also containing a chamber of this type, may be downloaded by clicking on the image. It is a 1 Mb file. On the title page, Missimers at this point said "thirty three years of excellence in test equipment" making their founding date 1932, over seventy years ago. The water/ethylene glycol and sodium dichromate fluid chiller shown above was made by Conrad/Missimer in the early 1970's while they were located in Corte Madera, California - near San Francisco, shortly before Bemco acquired them in 1972, while the temperature cycling and burn-in chamber was made by Missimer's Inc. in the late 60's. 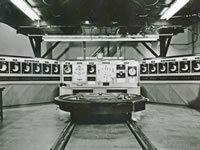 The Missimers FTV Temperature Vibration Chamber shown above was made in the late 60's. Dale Missimer, President of Conrad/Missimer in the late 60's and early 1970's and son of the founder of Missimer's Inc., wrote the chapter on "Environmental Test Equipment" in the ASRE DATA BOOK, the ASRE is now known as ASHRAE or the American Society of Heating and Refrigerating Engineers. The first two pages are shown above and may be downloaded by clicking on either image. It is a 792 Kb file. The illustrations on the second page of the chapter are all Missimers chambers. This document is too long to present in its entirety. The first two sentences in this document are "For the purposes of this chapter, environmental test equipment may be defined as test equipment designed to create, under controlled laboratory standards, the external conditions that may be encountered in actual service by an item of equipment or by personnel in the course of their work. The end objects of the creation of these conditions are first to assist the equipment designer in his preliminary work by exposing materials and subassemblies to their anticipated service environments in order to determine suitability, and second to test out completed items of equipment to make sure they will function satisfactorily in service." This is still a concise statement of exactly what we do at Bemco. Dale Missimer, together with Bill Holiday - a from time to time contributor to the success of Bemco - were the co-inventors of Cascade Refrigeration. A copy of their original paper describing their invention is available here. The document download is 951 Kb. You might notice that Bill Holiday, was at the time a Fellow of ASHRAE, while Dale Missimer was subsequently also made a Fellow for his many contributions to the science of refrigeration engineering and environmental testing. Today, we continue the tradition of Bemco and our subsidiary Conrad/Missimer. We fully understand the important contribution we make to the success of our customer's products and systems. Bemco chambers are built to last. We are truly focused on excellence. We are always proud to stand behind our equipment. Please request a free analysis of your needs.